Since it seems most of this part of the world is in a polar vortex, I thought I’d offer up a consolation prize to being stuck outside: popcorn chicken and waffle bits, from last year’s Brunch Life: Comfort Classics and More for the Best Meal of the Day by Matt Basile and Kyla Zanardi. Because I truly cannot think of a more suitable brunch scenario than a weekend with a high of -30. This version of chicken and waffles is brilliant—bite-sized fried chicken pieces are far less intimidating to make and cook, and are perfect for nibbling with bites of crisp waffle, all drizzled with a spicy Sriracha maple syrup butter. I love that everything can be eaten with a fork or fingers, and you don’t have to balance your plate on your lap to maneuver a knife. And it’s very conducive to sharing, if you find yourself in the vicinity of other people in their pyjamas. 1In a medium bowl, whisk the eggs and buttermilk. Cut the chicken into 1-inch pieces and add to the egg mixture, making sure they’re fully submerged. In a shallow dish, stir together the flour, garlic powder and salt. 2Heat an inch or two of oil in a heavy medium saucepan or deep skillet until it’s hot, but not smoking—a scrap of bread should sizzle when dipped in, or it should be about 350?F if you have a thermometer. Working in batches, remove the chicken pieces from the egg mixture and dredge in the flour, pressing as much onto the chicken as you can (particularly those damp bits of buttermilk and flour). Fry in batches, without crowding the pan, until crisp and deep golden, about 8-10 minutes. Transfer to a paper towel-lined plate. 3To make the waffles, in a medium bowl whisk together the flour, baking powder, sugar and salt. In another bowl or measuring cup, whisk the milk, egg and oil. Add to the dry ingredients and stir just to combine. Cook in a preheated waffle iron until golden and crisp, and cut into bite-sized pieces. 4In a small saucepan, melt the butter with the syrup and Sriracha, whisking until smooth. 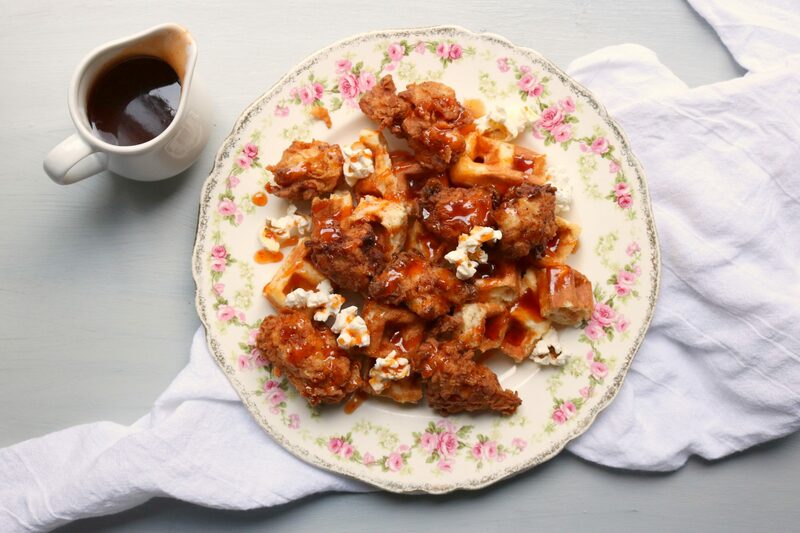 In a large bowl, toss the chicken pieces, waffle pieces, popcorn and a drizzle of the spicy maple butter. Serve in bowls, passing extra spicy maple butter at the table. Serves 4. I just love you, Julie. That is all I wanted to say. Only you could make a polar vortex seem warmer. Mmm. Looks like a very good way to warm up an especially cold February (-28 without wind chill atm). Chicken with popcorn is something new. I need to try it.